When iOS 8 officially launches this fall, users will gain a number of useful new features in the system's native Photos app, making it easier to sort through large collections and make edits to pictures without having to launch another app. Like in iOS 7, photos are still sorted into increasingly wider views ranging from collections to years, and are automatically grouped by location. But discoverability is greatly enhanced with a new dedicated search button located at the top of the screen. 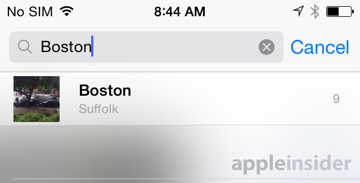 Tapping the search icon automatically presents users with a list of categories they can tap to narrow down their results, including pictures that were taken nearby from their current location. Users can also type in what they are looking for to search for images based on location or date. When an individual image is selected, a new heart-shaped icon is featured at the bottom, allowing users to quickly add that picture to their "Favorites" folder. 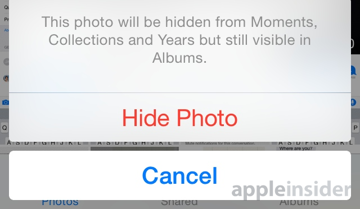 This folder is located in the "Albums" tab of the photos app, which also sorts pictures based on apps they may have been edited in, or what kind of files they are (panoramas, time lapse images, videos, etc.). There is no longer a general, redundant "Camera Roll" folder with all images. Instead, it has been replaced by "Recently Added." All folders can be reorganized as well —a change from iOS 7, when "Camera Roll" and "My Photo Stream" were pinned to the top. 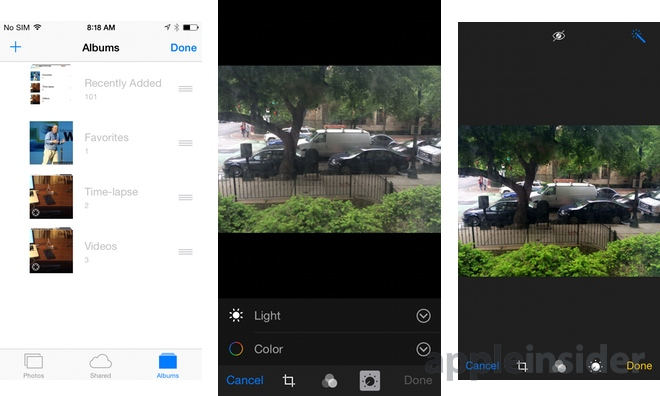 Editing pictures directly in the Photos app has also gained new, enhanced functionality in the first beta of iOS 8 provided to developers. Upon tapping the edit button, users are presented with a slightly tweaked interface, as buttons for the redeye removal tool and auto-enhance have been moved to the top of the screen, while the screen rotation function is consolidated within the cropping tool. 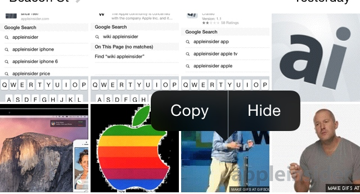 A new button at the bottom of the screen is what Apple is calling the "Smart Adjustment" tool. Upon selecting this, users are presented with controls for light and color, each of which can be expanded to allow fine tuning of brightness, contrast, exposure, vibrancy and more. When an individual adjustment is selected, a sliding tool appears at the bottom of the screen, allowing the setting to be tweaked and changes previewed on the picture in real time. The cropping tool in the iOS 8 Photos app also adds a fine rotation function, where pictures can be rotated at up to a 45-degree angle. Aspect ratio controls when cropping are now found in a small icon in the bottom right of the screen. 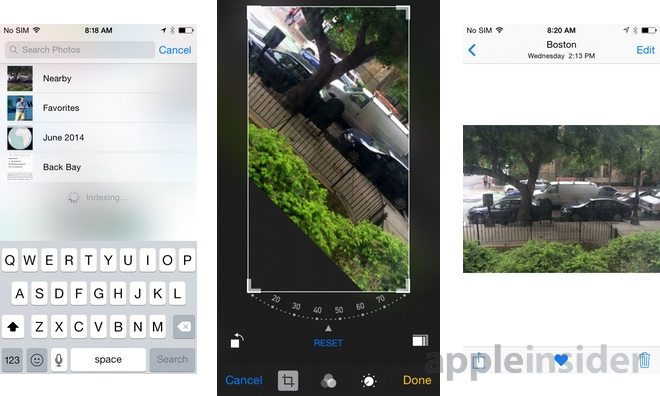 Finally Apple continues to offer its own default filters in the Photos app, but the company has opened up iOS 8 with new extensions that will allow third-party developers to plug in to Photos. 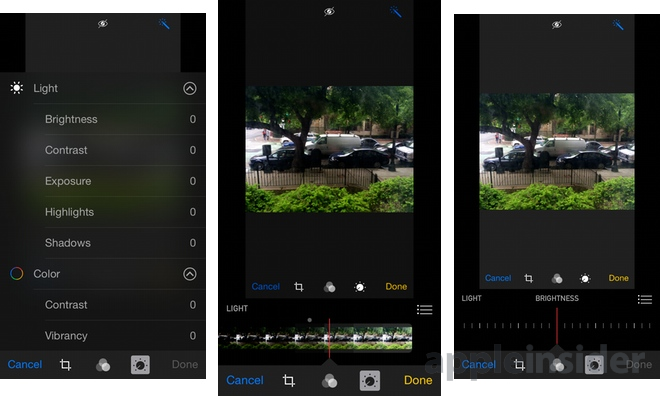 This means that filters and other editing tools can be added to the app once developers create them. "This photo will be hidden from Moments, Collections and Years but still visible in Albums."